Basil, the quintessential Italian herb, is actually a native of India. With more than a dozen varieties, like most herbs basil is a sold both fresh and dried, although the flavor profiles of each are quite different. Fresh basil has an almost sweet quality, with a mild anise/licorice flavor that just screams freshness, vitality and summer. Just sweet enough to be perfect in sorbet and ice cream, but flavorful enough to add a signature "je ne sais quois" to any dish. Salty and nutty, the ultimate condiment, pasta sauce and dressing. 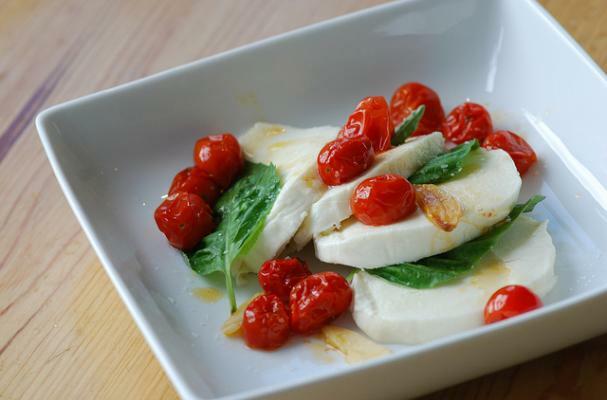 Fresh mozzarella, sliced tomatoes, and basil - lightly dressed with balsamic vinegar and olive oil, the quintessential Italian antipasto. Salty and buttery, roasted or grilled. You've never had pizza like this before! Be sure to use your favorite gluten free pizza crust! Citrusy, creamy and perfect for dipping or spreading. Key Lime Pie meets Italy in this refreshingly creamy tart. A refreshingly savory-sweet layer cake with silky frosting! Gluten free? Substitute your favorite gluten free flour blend.